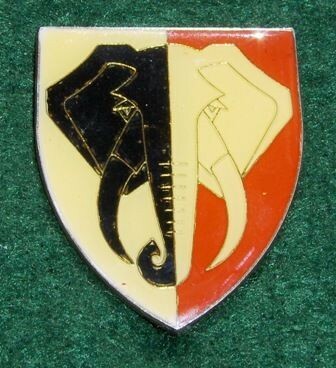 33/701 Battalion (701 BN) [Afr: 701 Bataljon] was formed in 1977 as 33 Battalion (33 BN) [Afr: 33 Bataljon] and renamed to 701 Battalion as part of the SWATF in 1980. It was based in Mpacha, Caprivi, in Sector 70. It took part in operations into Zambia and from 1978 deployed companies into Kavango, Kaokoland and Owambo. From 1983 a company of Marines were attached. It had an attached SWATF armoured car squadron and artillery battery. Dié Bn, voorheen bekend as 33 Bn, is gestig op 15 Augustus 1977 met standplaas in die Wes Caprivi onder bevel van Maj Geoff Preston Thomas ‘n voormalige lid van “The Kaffrerian Rifles” in Oos London in die RSA. 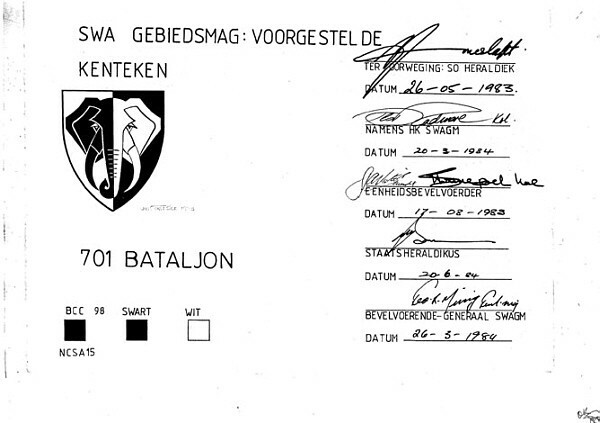 In 1980 verskuif die eenheid na Mpacha basis. Die Bn het bestaan uit ‘n Hk kompanie, Ondersteunings kompanie en 3 Infanterie Kompanies en ‘n Verkennings vleuel (Boesman spoorsnyers). In 1980 het die naamverandering plaasgevind as deel van SWAGM totstandkoming na 45 Bn onder bevel van Maj Errol Mann en daarna na 701 Bn. Toegevoegde sub-eenhede vanaf 1986 was ‘n Pantser Kar Eskadron en Artillerie Battery van SWAGM en SA Vloot Marinier Kompanie. Voor hierdie datum was die Pantser Kar Eskadron, Art Battery en die Mariniers onder direkte bevel van die Sektor Hk. Vanaf 1977 is die Bn ontplooi vir operasies in Zambië en sedert 1978 is kompanies ontplooi in Kavango, Kaokoland en Ovamboland. Die Bn het aan verskeie grensoperasies deelgeneem. In 1982 het Kmdt J.A. Victor bevel oorgeneem by Maj Errol Mann, gevolg deur Kmdt’e J.P Snyman en J. Haefele. Elkeen van hierdie bevelvoerders het voortgebou op sy voorganger wat die fasiliteite, administrasie, seremonieel en ontwikkeling van die Bn in operasionele paraatheid betref. 701 Battalion was founded on 15 August 1977 as 33 Battalion. Initially a SA Defence Force Unit under the command of Major G. Preston-Thomas, it had a strength of one company. It was mainly deployed inside Caprivi but took part in a number of external operations. 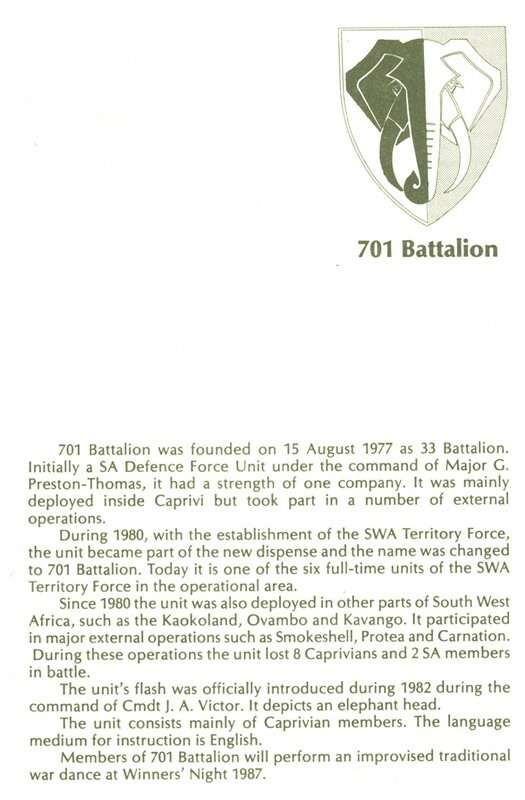 During 1980, with the establishment of the SWA Territory Force, the unit became part of the new dispense and the name was changed to 701 Battalion. Today it is one of the six full-time units of the SWA Territory Force in the operational area. Since 1980 the unit was also deployed in other parts of South West Africa, such as the Kaokoland, Ovambo and Kavango. It participated in major external operations such as Smokeshell, Protea and Carnation. During these operations the unit lost 8 Caprivians and 2 SA members in battle. The unit's flash was officially introduced during 1982 during the command of Cmdt J. A. Victor. It depicts an elephant head. The unit consisted mainly of Caprivian members. The language medium for instruction was English. All 9 images below are from the Personal Photo Collections of members of this portal which had been tagged with the 701 Battalion% Tag. Please note that while some images may be copyrighted by their respective owners, most have been loaded in good faith that you would not reuse them without written consent of the relevant member. PLEASE do contact the member first before you use his photos... its just common courtesy!